In this post we will learn about how to configure the foreign mapping between 2 controllers. 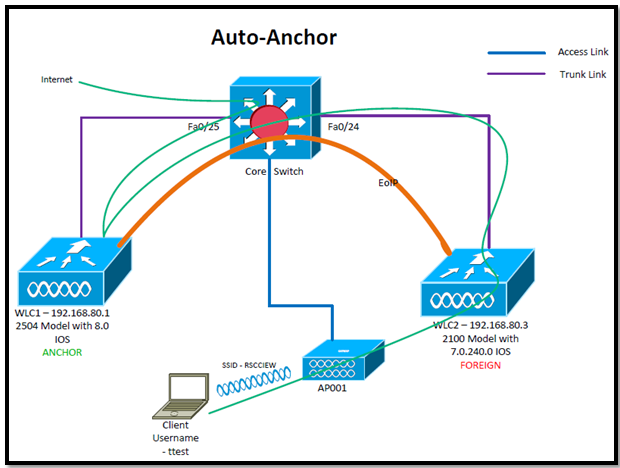 Auto-Anchor mobility, also known as Foreign Mapping, allows us to configure users that are on different foreign controllers from different physical location to obtain IP addresses from a subnet or group of subnets based on their physical location. First of all Both controller must have added each other in its mobility list. Auto anchoring must have conifgured. ***Make sure that it is only configured on Anchor Controller or where we want to terminate the client to get IP address. Step1: Select the WLANs tab. 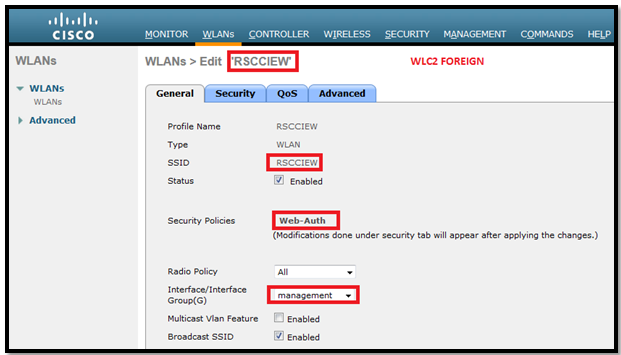 Step2: Click the Blue drop down arrow for the WLAN(iN my case RSCCIEW) and choose Foreign-Maps. Step3: The foreign mappings page appears. This page also lists the MAC addresses of the foreign controllers that are in the mobility group and interfaces which are created on Anchor WLC. 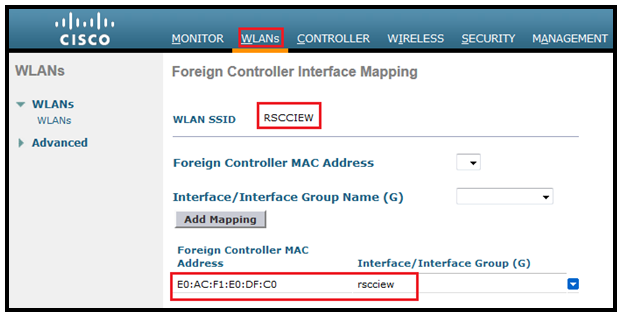 Step4: Select the desired foreign controller MAC(WLC2 in my case) and the interface(rscciew) to which it must be mapped and click on Add Mapping. In this post we will learn how to use Auto Anchoring feature. 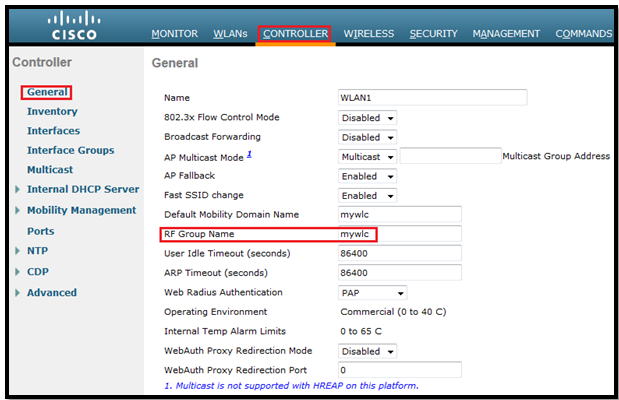 In simple words, Auto-anchoring is when we anchor a WLAN to a particular controller in the mobility domain or group. It can be used for load balancing & Security. We can force clients to be on a particular controller regardless of the controller they access the wireless network from. **The most common example/use for auto-anchor is with guest networking. With auto-anchor, regardless of which controller’s APs a client associates with, the client traffic is anchored to this one controller. Auto-anchoring is basically symmetric tunneling using a fixed anchor. 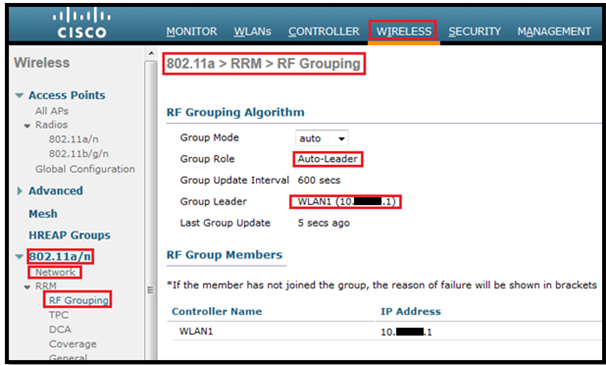 When a client first associates with a controller on an anchored WLAN, a Local Session entry is created for the client. The controller sends out a Mobile Announce message to the mobility group. When that message is not answered, the foreign controller contacts the configured anchor controller and creates a foreign session for the client in its database. The anchor controller then creates an Anchor session for the client. 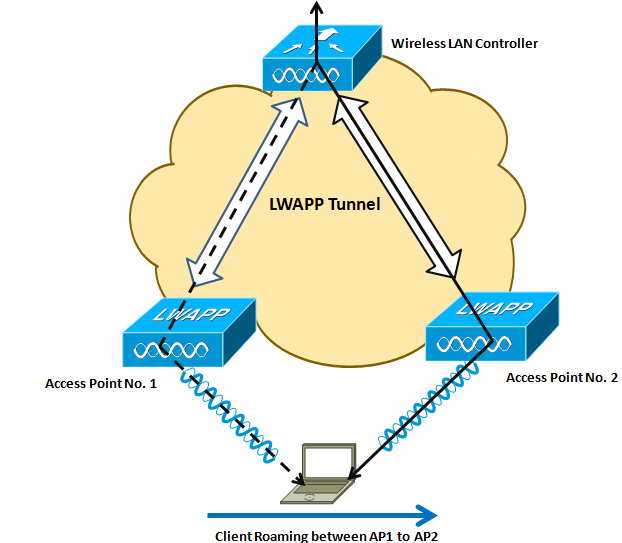 All traffic to and from the client associated with an anchored WLAN passes through the anchor controller. This is known as a bidirectional tunnel because the foreign controller encapsulates the client packets in EtherOverIP and sends them to the anchor. The anchor de-encapsulates the packets and delivers them to the wired network. Packets destined for the client are encapsulated in the EtherOverIP tunnel by the anchor and sent to the foreign controller. The foreign controller de-encapsulates the packets and forwards them to the client. We can configure multiple controllers as mobility anchors for a WLAN. We must disable the WLAN before configuring mobility anchors for it. Auto-anchor mobility supports web authorization but does not support other Layer 3 security types. We must configure the WLANs on both the foreign controller and the anchor controller with mobility anchors. On the anchor controller, configure the anchor controller itself as a mobility anchor. On the foreign controller, configure the anchor as a mobility anchor. Auto-anchor mobility is not supported for use with DHCP option 82. Our main aim is to force clients to be on a particular controller regardless of the controller they access the wireless network from. 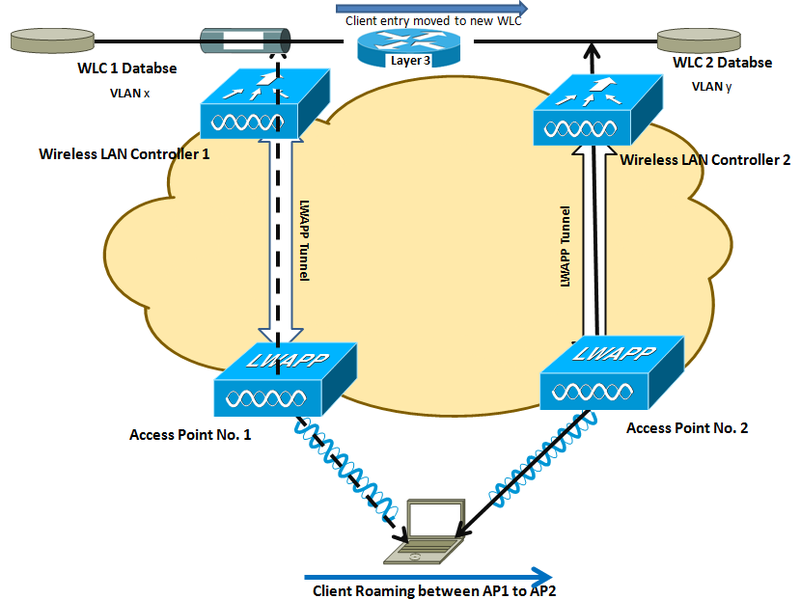 As per my Topology client connects to AP001 which is connected to WLC2 and traffic is tunneled back to WLC1, client must get IP from VLAN 192. Step2: Assign to Management interface and choose the security to webauth. Step4: Go to WLAN tab and assign the ANCHOR WLC. Step2: Assign the interface (guest), except this everything should be same as WLC2. In this case we will assign the ANCHOW WLC IP to local. From WLC1 (ANCHOR WLC) before webauth authentication. From WLC1 (ANCHOR WLC) After webauth authentication. *DHCP Proxy Task: Nov 07 10:05:06.586: 54:26:96:3e:4b:ee Static IP client associated to interface guest which can support client subnet. *DHCP Proxy Task: Nov 07 10:05:06.586: 54:26:96:3e:4b:ee DHCP success event for client. Clearing dhcp failure count for interface guest. (WLC2) >*pemReceiveTask: Nov 07 10:00:16.787: 54:26:96:3e:4b:ee 0.0.0.0 Removed NPU entry. *DHCP Socket Task: Nov 07 10:04:36.062: 54:26:96:3e:4b:ee DHCP success event for client. Clearing dhcp failure count for interface management. In this post we will test the mobility ping between 2 controllers. Controllers in a mobility list communicate with each other by controlling information over a well-known UDP port and exchanging data traffic through an Ethernet-over-IP (EoIP) tunnel. Because UDP and EoIP are not reliable transport mechanisms, there is no guarantee that a mobility control packet or data packet will be delivered to a mobility peer. Mobility packets may be lost in transit due to a firewall filtering the UDP port or EoIP packets or due to routing issues. We can test the mobility communication environment by performing mobility ping tests. These tests may be used to validate connectivity between members of a mobility group. Mobility ping over UDP: This test runs over mobility UDP port 16666. It tests whether the mobility control packet can be reached over the management interface. Mobility ping over EoIP: This test runs over EoIP(Port 97). It tests the mobility data traffic over the management interface. *** Only one mobility ping test per controller can be run at a given time. These ping tests are not Internet Control Message Protocol (ICMP) based. The term “ping” is used to indicate an echo request and an echo reply message. In this post we will see how the Layer 3 Roaming( inter subnet controller) roaming works on Controller. 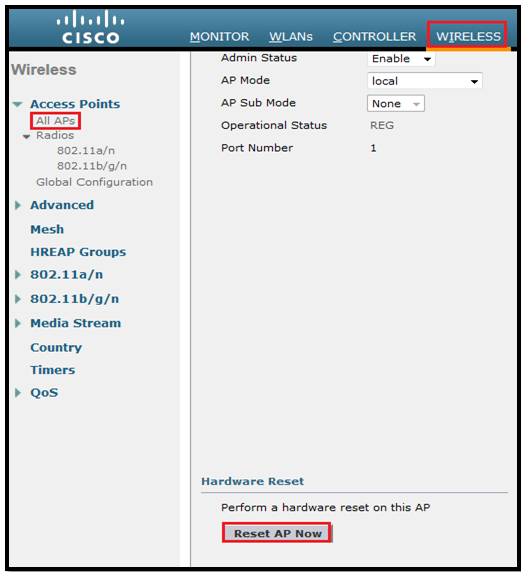 WLC2: 10.99.82.1, AP002 is connected to it. 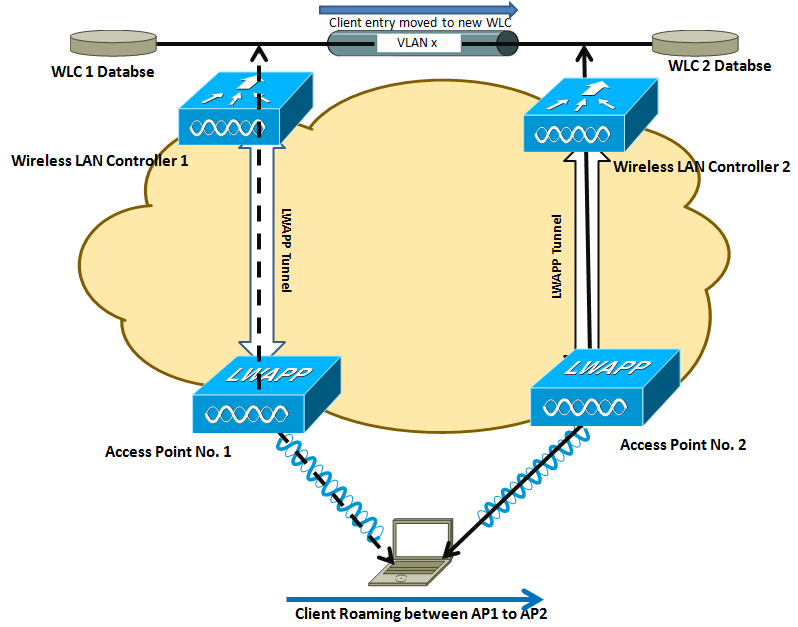 If the client roams between APs registered to different controllers and the client WLAN on the two controllers is on different subnets, then an inter-subnet roam, or Layer 3 mobility event, takes place. For example, if a client is on WLAN-X on Controller-1 using VLANx and the client roams to WLAN-X on Controller-2, but WLAN-X on controller-2 is using VLANy, then an inter-subnet roam for that client occurs. Inter-subnet roaming is similar to inter-controller roaming in that the controllers exchange mobility messages on the client roam. However, instead of moving the client database entry to the new controller, the original controller marks the client with an “Anchor” entry in its own client database. The database entry is copied to the new controller client database and marked with a “Foreign” entry in the new controller. 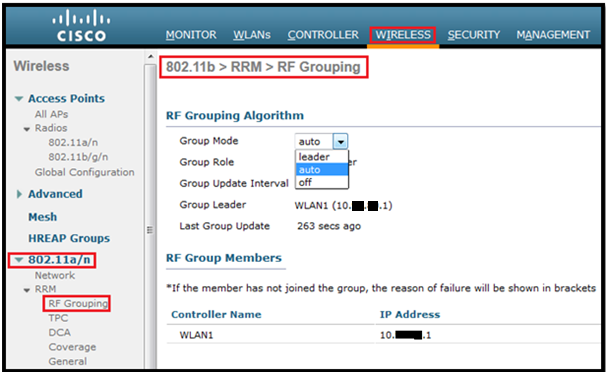 The roam remains transparent to the wireless client, and the client maintains its original IP address. In inter-subnet roaming, WLANs on both anchor and foreign controllers need to have the same network access privileges and no source-based routing or source-based firewalls in place. Otherwise, the clients may have network connectivity issues after the handoff. When the client roams between them, the controllers still exchange mobility messages, but they handle the client database entry in a completely different manner. The original controller marks the client entry as Anchor, whereas the new controller marks the client entry as Foreign. The two controllers are now referred to as anchor and foreign, respectively. The client has no knowledge of this and retains its original IP address on the new controller. Traffic flow to and from the client on the network becomes asymmetrical. Traffic from the client is bridged directly to the wired network by the foreign controller. The foreign controller spoofs the IP and MAC address of the client. 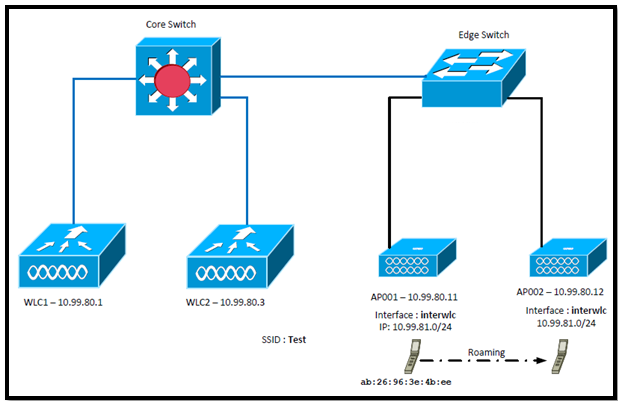 Traffic from the wired network to the client, however, is received by the original controller and sent to the new controller through an Ethernet over IP (EtherIP) tunnel to the new controller. The new controller then passes that traffic to the client. If the client roams back to the original controller, the Anchor and Foreign markings are removed and the client database entry is deleted from the foreign controller. If the client should roam to a different foreign controller, the original anchor controller is maintained, and the foreign client entry is transferred to the new foreign controller. First my client is already connected to AP001. Now to remove the client form WLC1, I will reset the AP001 because we want to see if client can roam to AP002 or not with keeping the same IP. *** But make sure that WLC must have Anchor-Foreign setup. So now our client moved to AP002. ***It is important to remember that a Layer 3 mobility event occurs only when the interface assigned to the WLAN between the controllers is not the same. Whether or not the management interfaces of each controller are in the same subnet has no bearing on a client Layer 3 roaming event. In a Layer 3 roaming scenario, traffic returning to the wireless client goes through the anchor WLC. 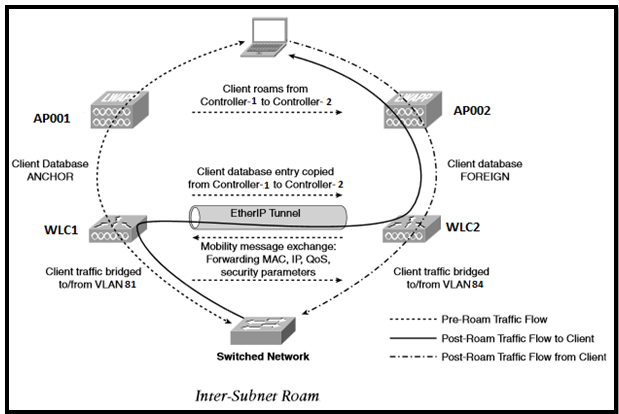 The anchor WLC establishes an Ethernet-over-IP (EoIP) tunnel to forward client traffic to the foreign WLC where it is then delivered to the client. All traffic originated by the client is forwarded out the corresponding VLAN interface to which the WLAN is mapped to at foreign WLC. The client’s original IP address and default gateway IP (MAC) address remain the same. All traffic, other than that which is destined for the local subnet, is forwarded to the default router where the foreign WLC substitutes the client’s default gateway MAC address with the MAC address of the default gateway associated with dynamic interface/VLAN at the foreign controller. The client begins with a connection to AP001 on WLC 1. This creates an ANCHORentry in WLC 1’s client database. As the client moves away from AP001 and begins association with AP002, WLC 2 sends a mobility announcement to its peers in the mobility group looking for the WLC with information for the client MAC address. WLC 1 responds to the announcement, handshakes, and ACKs. The client database entry for the roaming client is copied to WLC 2, and marked as FOREIGN. 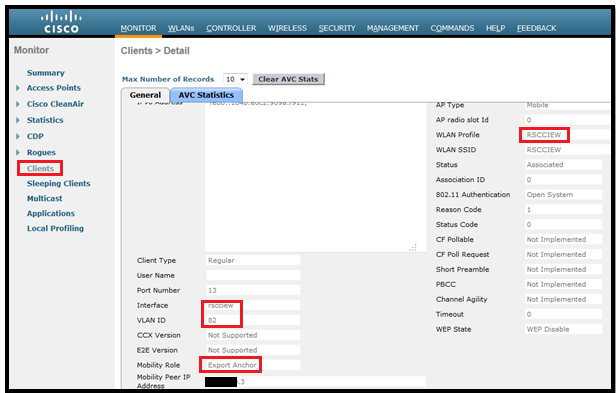 A simple key exchange is made between the client and AP, the client is added to WLC 2’s database, which is similar to the anchor controller’s entry, except that the client entry is marked as FOREIGN. Data being sent to the WLAN client is now EoIP tunneled from the anchor WLC to the foreign WLC. Data sent by the WLAN client is sent out a local interface VLAN at the foreign controller. In this post we will see the roaming between inter controllers. Inter-controller roaming occurs when a client roams between two APs registered to two different controllers, where each controller has an interface in the client subnet. When a client roams between controllers on the same subnet, the controllers exchange mobility messages, and the client database entry is transferred from the original controller to the new controller. Client traffic then flows through the new controller on to the network just like it did on the original controller. Now I will reset AP001 to disconnect my client forcefully to check the roaming. 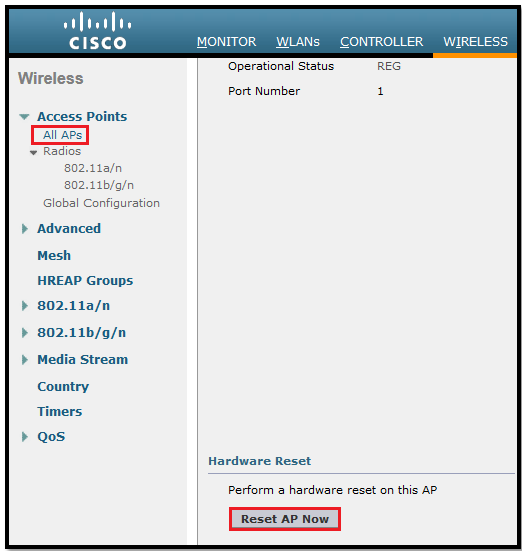 Go to Wireless > All AP and then click on AP001 > Reset AP Now. Once AP001 will reset after that our client will roam to another AP(AP002). See the logs for client which moved to WLC2. 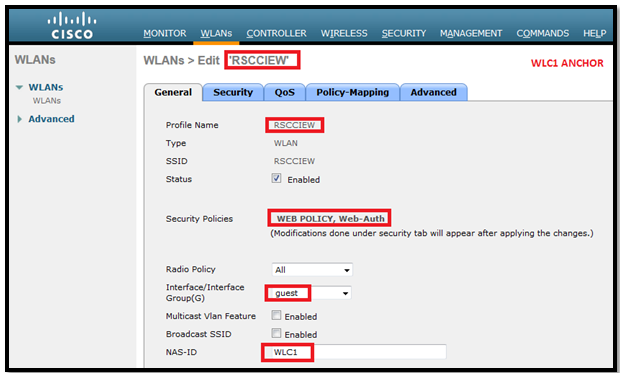 In this post we will learn how to configure WLC mobility on Cisco Controllers. Mobility, or roaming, is a wireless LAN client’s ability to maintain its association seamlessly from one access point to another securely and with as little latency as possible. A mobility group is a set of controllers, identified by the same mobility group name that make seamless roaming for wireless clients. By creating a mobility group, we can enable multiple controllers in a network to dynamically share information and forward data traffic when inter-controller or inter-subnet roaming occurs. Controllers in the same mobility group can share the context and state of client devices as well as their list of access points so that they do not consider each other’s access points as rogue devices. First of All we need to configure Mobility Group name on each controller while setting up (Initial Config) the controller. To add an entry to a controller mobility configuration using the GUI, go to CONTROLLER > Mobility Management > Mobility Groups and click on New. Here we enter the MAC address and IP address of the controller management interface we are adding along with the mobility group name of that controller. In WLC1 we will add WLC2 mac and IP address. In WLC2 we will add WLC1 mac and IP address. Here I will posts the screenshot from WLC1, we also need to add same in WLC2. Identical mobility group names: The mobility group name is case sensitive. A mobility group name of ABC is not the same as abc from the controller perspective. Same virtual interface IP address: If the virtual IPs are not the same between the controllers, the handoff of the client database entry will not take place and the client will be disconnected for a short period. Same version of code: This is true for supporting normal client mobility. Starting with the 5.2 release, a 5.2 or 6.0 controller supports auto-anchoring with 4.2 and higher code running on the anchor controller. Network connectivity between the controller in the mobility group: We should be able to mping and eping between the controllers. These special pings will be discussed in other post. IP connectivity must exist between the management interfaces of all controllers. 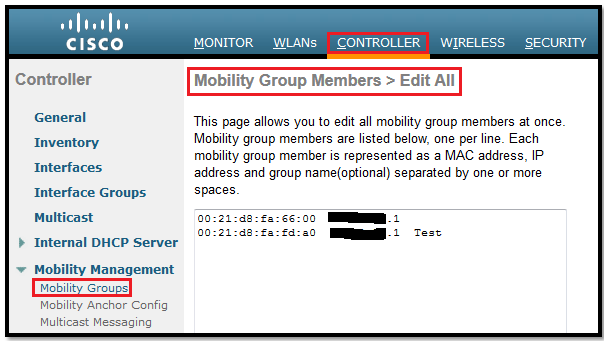 All controllers must be configured with the same mobility group name. All controllers must be configured with the same virtual interface IP address. We must have gathered the MAC address and IP address of every controller that is to be included in the mobility group. This information is necessary because we will be configuring all controllers with the MAC address and IP address of all the other mobility group members. When we configure mobility groups using a firewall, for example, Cisco ASA, we must open port 16666, and IP protocol 97. We have only 2 WLC so we will not configure Multicast Group IP address in this post. 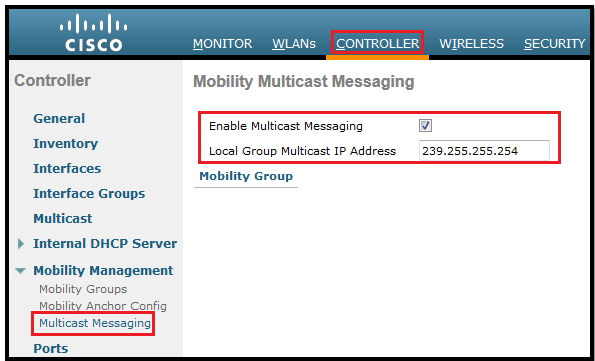 If we have multiple controllers in Mobility Group then we must configure Multicast Group IP address on each controller. Mobility, or roaming, is a wireless LAN client’s ability to maintain its association seamlessly from one access point to another securely and with as little latency as possible. In This post I will try to elaborate how mobility works when controllers are included in a wireless network. In wireless networiking , roaming means to the ability to move from one AP coverage area to another without interruption in service or loss in connectivity. This is the key component in wireless network deployment. A mobility group is a set of Wireless LAN Controllers, by the same mobility group name, that defines of seamless roaming for wireless clients. By creating a mobility group, we can enable multiple WLCs in a network to dynamically share information and forward data traffic when inter-controller or inter-subnet roaming occurs. Controllers in the same mobility group can share the context and state of client devices as well as their list of access points so that they do not consider each other’s access points as rogue devices. With this information, the network can support inter-controller wireless LAN roaming and controller redundancy. Roaming is the action for a Wireless client to move from one AP to another AP while actively transmitting data without any interruption. For Voice WLAN: It very common to have roaming. For Data WLAN: For data deployment, it can be nomadic; user can get slight interruption while moving from one coverage area to another without impacting the user experience. 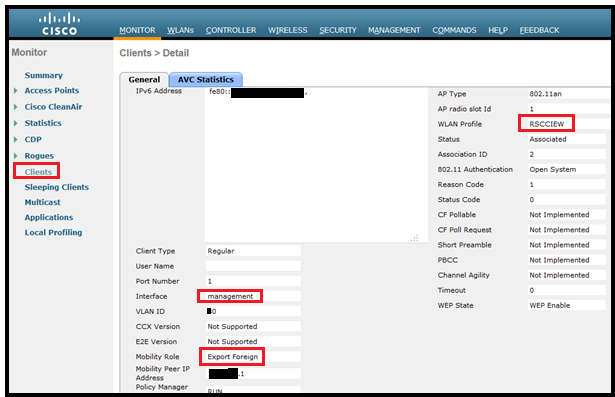 When a wireless client connects and authenticates to an AP, the AP´s controller (where AP is connected) put an entry for that client in its database, which contains the information of client like: Mac address, IP address, WLAN associate with and the AP where client is connected…etc. If we have the controller based deployments then Roaming can be of three types. Intra controller roaming is the roaming between LAP’s managed by the same WLC, obviously in the same IP subnet. It is necessarily about the subnets that the clients are using that are serviced by the APs. So, let’s say we have 2 APs, both of which are servicing a specific IP subnet. When client roam from one AP to the other, which is layer 2 roaming. The client still maintains its IP address. Wireless Clients move from one AP to another AP in same controller. When client moves its association from one access point to another, the controller simply updates the client database with the newly associated access point. This entry includes the client’s MAC and IP addresses, security context and associations, quality of service (QoS) contexts, the WLAN, and the associated AP. Sometimes it does also establish the new security context means if during roaming a clients session timeout or key change occurs then this information should pass to WLC. If we have open authentication then WLC don’t need to establish or update security Context. This Roaming process take less then 10ms (It almost seamless). Lab result and logs will follow soon……………………………………………..
Now when we do a layer to roam and multiple controllers are involved, then both controllers need to service the same subnet. This would mean that we have a dynamic interface in subnet x configured on WLC1 and another interface that is also configured on subnet x on WLC2. This would be Inter controller roaming (Layer 2). The wireless user moves from one AP to another AP connected to another controller in the same subnet (as the first controller). 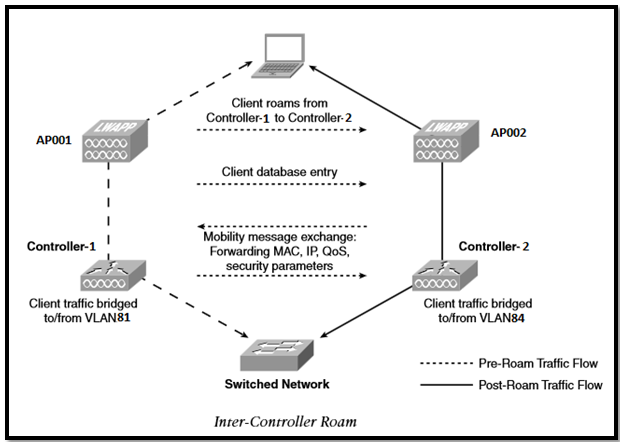 It means that the client is roaming between two different controllers, but, these controllers can be part of the same Mobility Group and the same subnet. When the client tries to join the new AP, both controllers exchange the client details (database entry and credentials). The new WLC exchange mobility message with the original WLC and the client entry is moved to new WLC. This entry includes the client’s MAC and IP addresses, security context and associations, quality of service (QoS) contexts, the WLAN, and the associated AP. Client database entry is updated for the new access point. This process takes less then 20ms and remains transparent to the user. 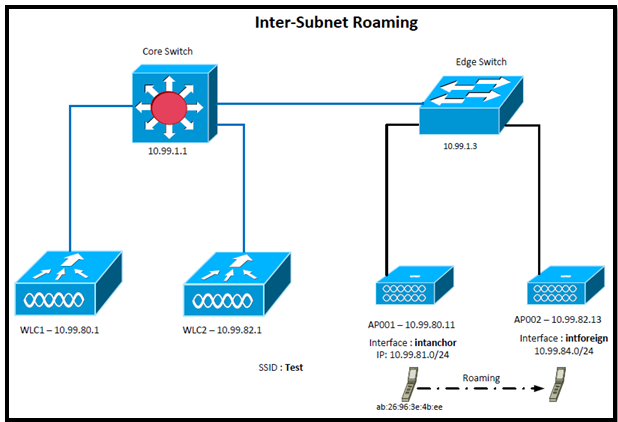 The wireless user moves from one AP to another AP connected to another controller in a different subnet or if the clients roam between APs registered to different controllers and the client WLAN on the two controllers is on different subnet, then it is called inter-controller L3 roam. It’s similar to inter subnet roaming. Controllers exchange mobility messages on the client roam. However, instead of moving the client database entry to the new controller, the original controller marks the client with an “Anchor” entry in its own client database. The database entry is copied to the new controller client database and marked with a “Foreign” entry in the new controller. The main advantage is clients maintain its original IP address even after changing the controller. The process takes less than 30 ms. The roam remains transparent to the wireless client.